B. Testa, Preface--"Not Known, Because Not Looked For." L.P. Balant, K. Roseboom, and U.M. Gundert-Remy, Pharmacokinetic Criteria for Drug Research and Development. H. Boxenbaum and R.W. D'Souza, Interspecies Pharmacokinetic Scaling, Biological Design and Neoteny. U.A. Meyer, U.M. Zanger, D. Grant, and M. Blum, Genetic Polymorphisms of Drug Metabolism. B.K. Keppler, M.R. Berger, Th. Klenner, and M.E. Heim, Metal Complexes as Antitumor Agents. R. Thomas, P. Gray, and J. Andrews, Digitalis: Its Mode of Action, Receptor, and Structure-Activity Relationships. Index. 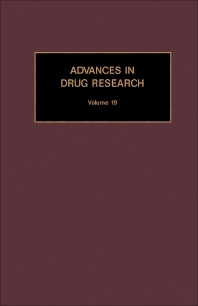 Each volume in this distinguished series presents authoritative reviews on topics of broad interest in drug research and on novel and established therapeutic classes. Acknowledged experts contribute in areas such as drug design, clinical and molecular pharmacology, drug metabolism, and mechanisms of action. Reviewers have consistently praised Advances in Drug Research for its comprehensive and lucid summaries of up-to-date knowledge. Pharmacologists, medicinal chemists, and toxicologists.